A climber named Bo Parfitt who was climbing with Himalayan Experience departed for home and left K2 base camp on July 7th. It was reported that Bo was going through headache after second rotation and spending a night at camp 2 on K2 Cessen route. 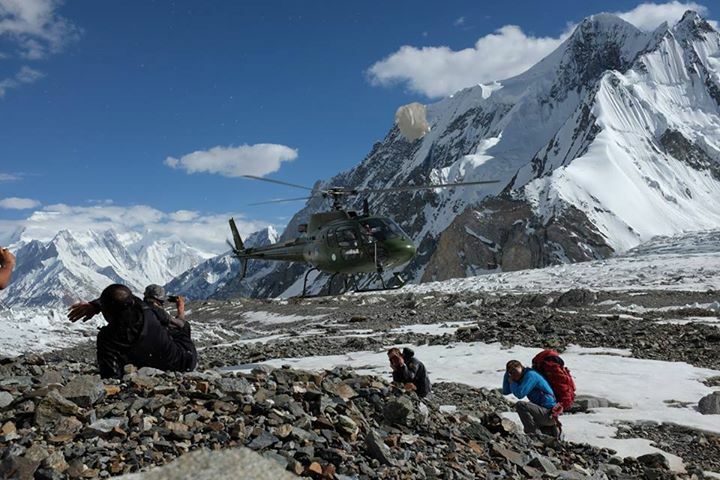 He was evacuated from base camp by Pakistan Army helicopter. Alec Turner was the second climber of Himalayan Experience who departed for home the very next day, on July 8th. He was not carried by helicopter; he instead walked out of base camp. I inquired into it and asked few local guides and some army sources about the reasons two climbers left base camp. I was told by credible sources that for Bo Parfitt there were some personal reasons, Bo was missing family (Bo also has a new born child at home). Bo Parfitt was further taken over by headache due to altitude. The reason reported for Alex Turner’s departure was also headache and vision issues due to altitude and they barely survived an avalanche, I was also told by my sources that his head was not in the climb, or in other words he was not getting vibes to climb K2. Headaches does not qualify as emergency, Pak army was quoting $40K for non-emergency evacuations. Bo Parfitt apparently paid $40k to get off base camp and Alec Turner preferred to walk instead of paying $40k.